At compile time, pointer literals are represented by symbolic names. Definition at line 635 of file ThreadSafetyTIL.h. Definition at line 637 of file ThreadSafetyTIL.h. Definition at line 643 of file ThreadSafetyTIL.h. 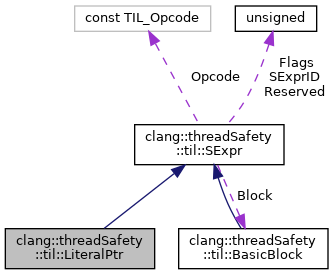 Referenced by clang::threadSafety::til::PrettyPrinter< StdPrinter, std::ostream >::printLiteralPtr(). Definition at line 640 of file ThreadSafetyTIL.h. Definition at line 651 of file ThreadSafetyTIL.h. Definition at line 646 of file ThreadSafetyTIL.h.